Walking through the peace and tranquility of ‘Canada Park’ with Israeli families picnicking around you, it’s nearly impossible to tell that you’re in the occupied West Bank, treading on the site of two destroyed and evicted villages from the 1967 war. 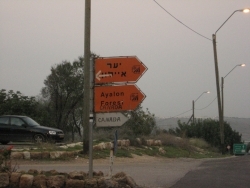 Established in 1973 through donations fundraised by the Jewish National Fund (JNF) in Canada, Ayalon/Canada Park sits on top of the Palestinian villages of Imwas and Yalo, just off the Jerusalem-Tel Aviv highway. Nearby, the Jewish settlement of Modi’in sits on top of the Palestinian village of Beit Nouba, also demolished in 1967. In Canada, the JNF, which enjoys charitable status, is fundraising for "renewal and development" of the park. Ahmad Abu Gaush is an Imwas refugee and current head of the Imwas association, which demands the right to return for the displaced villagers. In a Ramallah coffee shop, he describes the terror and confusion of the early hours of June 5, 1967. "My family left an hour before the soldiers reached us... We walked through the mountains for 32 kilometres with no food or water until we reached Ramallah," he says, adding that when the soldiers arrived they ordered everyone to leave the village, firing their weapons in the air. Now 54, Abu Gaush was 14 when he was forced to flee his home. As we look at photos of Imwas before it was destroyed, he reminisces about the calm beauty of his village and how he feels Israel stole his childhood. He says that when his older brother tried to return with several hundred villagers a week after the war, they were stopped before they got to Beit Nouba and ordered back, after which he maintains the army destroyed what remained of the villages. Growing up in Ramallah, Gaush says that West Bank Palestinians were able to visit the village until 1991. After the First Gulf War, however, the Israeli military erected a checkpoint, barring displaced villagers from visiting their land. “When returning to the park, I had mixed feelings. It’s very hard, standing on the ruins of where you used to live while seeing people laughing, eating and enjoying themselves,” he says. Israel’s wall now encompasses the park and it has become virtually cut off to West Bank Palestinian access. John Reynolds, a legal researcher with the independent Palestinian human rights organization Al-Haq, argues that displacement and destruction of the three villages located in the Latroun Valley constitutes a war crime. “The forcible transfer of people from their villages and the destruction of those villages are defined as a grave breach of the Geneva Convention, which is in the category of the most heinous war crimes,” he says. Al-Haq has officially released a report about the Latroun Valley and Canada Park, contending that the Israeli government, JNF Canada and the Canadian government bear responsibility in violating international law and human rights. The report, which was shown to villagers on December 3, combines their affidavits, recorded testimony of soldiers serving during the displacement, maps, photos and legal analysis. “The state of Israel bears the primary responsibility for the human rights violation. The JNF also has legal responsibilities as a charitable organization and NGO, not only to Canadian charitable laws but also international law,” Reynolds argues. He adds that the Canadian government also holds some responsibility because the money to build Canada Park came through government-subsidized tax exemptions. Looking around the park, the only visible signs of previous inhabitants is a crumbling cemetery with Arabic engraved on the stones and a series of old stone village walls. On some of the walls at the entrance to the park are rows of plaques commemorating Canadian donors such as the City of Ottawa, the Metropolitan Toronto Police Department, former Ontario-premier Bill Davis, and Toronto city councillor Joe Pantalone, who helped make the park possible. There is no visible sign postage about the villages that pre-date Canada Park or their inhabitants. Eitan Bronstein, however, is not surprised. Bronstein works with Zochrot, a mainly Jewish Israeli organization that educates the Israeli public on the creation of Palestinian Refugees in 1948 and 1967. “For Israel, it’s better not to show the history because if you know the history, you have to take responsibility. It’s easier for Israel and the JNF to keep the myth about blooming the desert,” says Bronstein. Often, he adds, people get angry when confronted with this history. Wandering Canada Park, many people I speak with have no idea that villages had ever existed or that the park is officially in the West Bank. 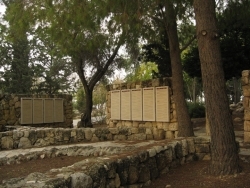 Only one person from a nearby kibbutz knew the park's history, acknowledging many of the kibbutz residents boycotted the park because of the evictions, before returning to her picnic. Submitted by Valerie Guillaume (not verified) on Thu, 2009-04-02 18:45. Canada's contribution to human rights abuses, both here in its own country and around the world, is only now being recognized. We need more people like you and me to exposed its hypocrisy on the issues of human rights. Speaking of the actions of the Toronto police in contributing to the building of this park. It shows that this is what they are all about. Racism, corruption and human rights abuses.